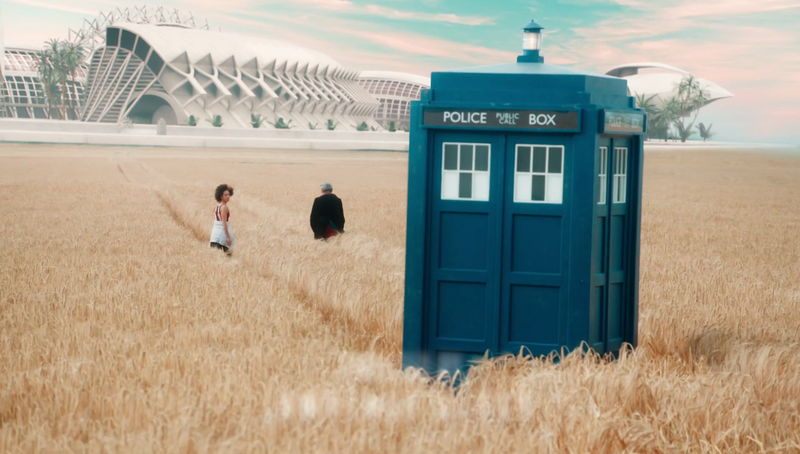 Doctor Who heads to the future as the Doctor and Bill go on their first proper adventure to one of humanity’s first colonies and encounter a mystery when they arrive. Part of the appeal of this show is that it can be so many things. There’s no such thing as a “typical” episode of Doctor Who in the modern era though there are episodes that feel more familiar than others. This episode definitely feels familiar in terms of structure and execution. It’s a high concept idea that allows the characters to work together while getting to the bottom of it. As a first proper outing for the Doctor and his new companion it’s a good one because there’s a mystery to solve and plenty of opportunity for the Doctor to show off. I’ll start with the mystery. The basic setup of the episode was really strong. I like the idea of emojis being used to communicate feelings. On the surface it seems fairly stupid but there’s a lot to it beneath the surface. It breaks down emotion to its most basic level without understanding the underlying reason for that emotion. On one level it encourages communication as in theory it could be encouraged to communicate the reasons for why you feel that way. It could essentially remove dishonesty and lessen the potential for misunderstandings. It seems fairly idyllic when you look at like that. On another level there’s something sinister about it. It could be seen as an invasion of privacy as many people consider their emotions to be something that they have the right to keep to themselves. Obviously there are biological indicators that betray how people are really feeling but the emojis remove that uncertainty. Could this be a commentary on the loss of privacy in our society through social media? The mandatory communication tech that is built into everyone on the colony as seen when the Doctor and Bill receive it against their will could be a reference to the fact that many of us are constantly connected to other people in one way or another through our smart phones. The episode does nothing with this but the underlying idea is there and it certainly made me think. Sometimes in science fiction planting the seed and letting people think about it as they relate it to their own lives is enough. It turns out that stripping emotions to their most basic level without truly understanding them is exactly the problem here. The colony is built by and built on microscopic robots called Vardies. They track the well being of the colonists through the emojis that are displayed on their back. Their primary function is to create happiness for the colonists so their programming has got to the point where anything that isn’t happiness is considered a threat. Those threats are dealt with and there you have the reason for them turning against the colonies. I like that there is no malicious intent by the Vardies. All they are doing is what they are programmed to do but they’re taking it to an extreme that nobody accounted for. The Doctor explains this by telling the story of a man granted three wishes who doesn’t get what he wants. In the story the man wasn’t completely clear on what he wanted so he was given what he asked for in a way that wasn’t what he intended. Humanity’s approach to the Vardies is like this because they were programmed to make the colonists happy while bearing in mind the underlying purpose of the colony in the first place. 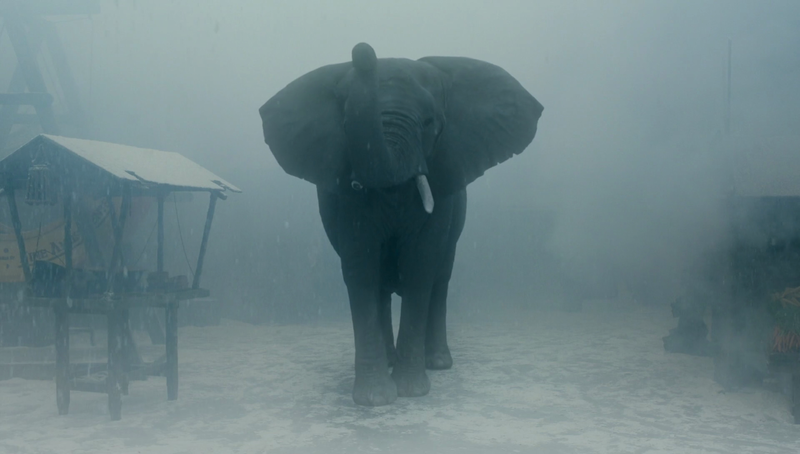 It was supposed to represent hope and other positive things so it seems that the programmers simply didn’t consider the negative aspects which meant that the Vardies had no idea how to deal with them. This idea reminded me a lot of the Nanogenes seen way back in “The Empty Child” and “The Doctor Dances” as they were only following their programming which caused issues because they lacked the proper context. It’s mentioned that grief is something they were incapable of understanding so simply decided they would wipe it out. Grief creates sadness which is the opposite of happiness so anyone experiencing grief simply has to go. It seems brutal but all the Vardies are doing is what they were programmed to do. Human short sightedness is the enemy here and the Doctor is all too happy to point that out. I found all of this really interesting and the episode builds that mystery well. 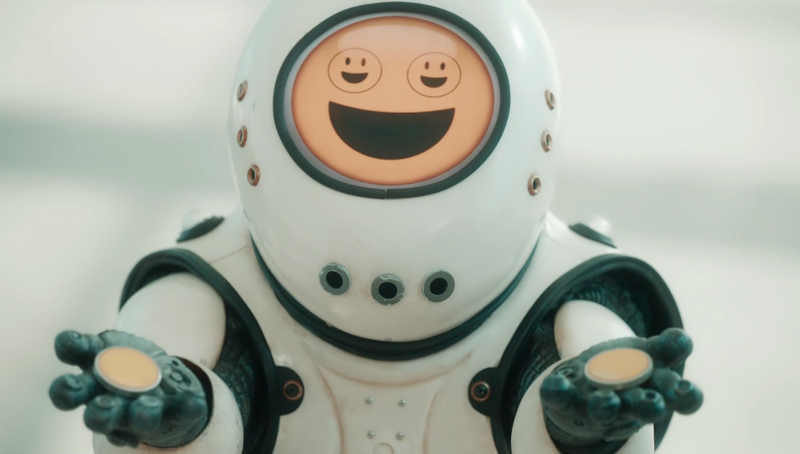 The white hallways of the empty colony created the right sense of dread and the emoji robots were more than creepy enough to carry the episode. I found the soulless expressions to be really effective and watching the faces change as they approached the expression that meant they were about to attack created a real sense of urgency. All of this contributed to a really unsettling atmosphere that contrasted the brightness of the setting and it just shows that not every enemy needs to have a malicious agenda to be effective. The resolution of the mystery made sense in context but it also felt a little rushed. The Doctor goes from explaining everything to rebooting the Vardies in no time and it feels somewhat jarring. His explanation for why he did that and what it means from now doesn’t quite work as there are still a lot of lingering questions afterwards. The episode pretty much glosses over the fact that they have become sentient so I wonder why it was necessary to point that out as it doesn’t add anything. It almost feels like the episode runs out of time because it used so much of it establishing the mystery to get to that point and has got very little left to wrap it up. It’s a shame that there’s such an imbalance as the explanation could have worked if a little more time was spent on it. I really like the dynamic between the Doctor and Bill. There’s always the danger that having a new companion constantly asking questions about everything we already know could get tedious but that doesn’t happen here. Bill’s level of curiosity feels unique as she asks different kinds of questions. This episode had her fixating on the Doctor having two hearts as the very idea is fascinating to her. She also has a different insight on the Doctor’s role in the universe. Once it has been identified that there is a problem she asks if there are authorities that they can go to which the Doctor dismisses. We know that he’s going to solve the problem and Bill does too but what she doesn’t know is why. 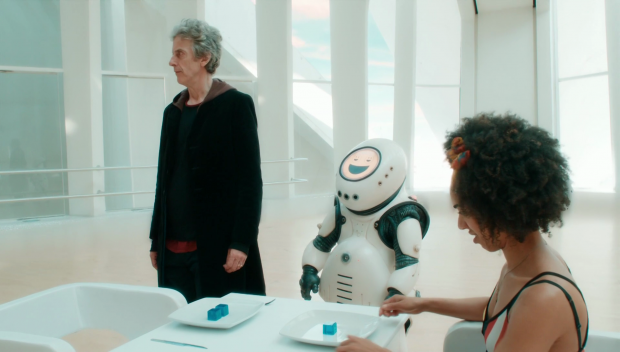 Every companion has their own opinion on why the Doctor does what he does and Bill thinks that he sees himself as a policeman who travels around solving problems. She puts that together from the TARDIS being stuck as a police box and his general commitment to resolving situations. 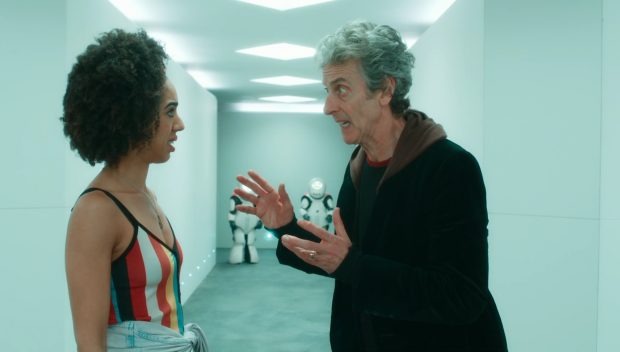 Her assessment seems to fit what we know of Peter Capaldi’s version of the Doctor so far. Christopher Eccleston, David Tennant and Matt Smith all played the Doctor as a man carrying a lot of guilt and it was often used to motivate his actions but Peter Capaldi’s version simply seems to enjoy going on adventures and gets some kind of thrill out of saving people while solving unique problems. It’s refreshing to see and it keeps the tone nice and light. I really will miss this version of the Doctor when we lose him at Christmas. Outside of that, Bill seems to be a really interesting character in her own right. Her naivety and general curiosity are really endearing as well as her level of excitement as she encounters new things. We see more of her behaving compassionately and thinking laterally about the problem they’re faced with. I also like that she’s a little slow on the uptake such as when she eventually realised she could take a photo of the map she was looking at rather than simply stand next to it. We saw a bit of that last week when it took a while to register that the TARDIS was bigger on the inside. She isn’t stupid but does seem to be easily overwhelmed by new concepts which creates a delay on her brain processing them. Having her take a while to realise things is really refreshing as it makes her feel much more real. We all miss the obvious sometimes and Bill is no different. There is some mention of the clear endgame for the series. The vault will be an enduring mystery and it’s mentioned here but we have the added information of the Doctor taking an oath to not leave Earth unless it was an emergency. Why did he make the oath? Who did he pledge it to? What counts as an emergency? Will there be consequences to him breaking it to take Bill on an adventure? This is what I call building up a season arc by teasing more information as the episodes progress rather than the previous tactic of constantly reminding us that there was an ongoing story without expanding on it. So far so good for this season. A really enjoyable episode that had a strong central mystery. Having humanity communicate through emojis is an interesting idea as it breaks emotion down to its simplest level which does end up causing the problem. It can be good as it promotes honesty among the population but it can also be seen as an invasion of privacy since people can’t keep their feelings to themselves if they want to. The Vardies don’t understand the context of the emotions so that ends up causing the confusion that leads to them killing the colonists. There is no malicious intent as it was human short sightedness that meant the Vardies weren’t programmed properly. It works really well and shows that there doesn’t always need to be a villain. The resolution of the mystery felt very rushed and came across as if the episode had run out of time. There was no justifiable reason to have the Vardies be sentient as the programming angle worked just fine and there wasn’t enough explanation for why the problem was solved. Bill and the Doctor have a compelling dynamic so far and I like that Bill is unique in the way she looks at things such as the Doctor’s role in the universe. It’s also refreshing to see that obvious things don’t always immediately occur to her as it makes her feel more real. The ongoing story is expanded through mention of an “oath” which creates more questions and keeps the enduring vault mystery ticking over. Now what have we wandered into?